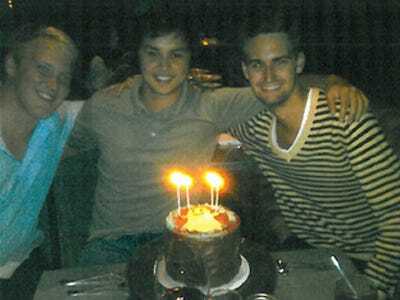 Evan Spiegel and Bobby Murphy on the right, Brown on the left during happier times. Popular photo-sharing app Snapchat was founded by two Stanford University fraternity brothers, Evan Spiegel and Bobby Murphy.Fellow classmate Frank Reginald Brown IV alleges the pair stole his idea. So Spiegel and Murphy, whose app has been said to threaten Facebook, are facing a lawsuit similar to ones that challenged Facebook CEO Mark Zuckerberg soon after he launched the company. And if you read the case, it’s compelling. Snapchat allows its millions of users to send quick picture messages to friends, sort of like a visual text message. But moments after the recipient opens the photo, it disappears. No images can be saved on the app, so some have called it the perfect platform for sexting. But it also offers high schoolers and college students a relief from the constant self-exposure that’s practically demanded by services like Instagram, Facebook, and Twitter. It’s a private, intimate experience that doesn’t go down on their permanent record. Brown says he approached Spiegel, his dormmate, with the idea for Snapchat. They verbally agreed to work on Snapchat together and hunted for a technical cofounder. That’s when Murphy came into the picture. Brown became the company’s CMO, Murphy was the CTO, and Spiegel was the CEO. The app was initially called Picaboo, and Brown says he designed the ghost icon, Ghostface Chillah. There’s a photo in the lawsuit that shows a photo of Brown, Spiegel and Murphy the day Picaboo launched in the iTunes store. They’re all smiling around a cake that has the ghost icon on it (above). Things went south in August 2011, alleges Brown. Brown says there was a “contentious telephone conversation” about the app’s future, during which Spiegel “abruptly hung up.” After, Spiegel and Murphy allegedly stopped returning Brown’s calls. They allegedly changed passwords so Brown could no longer access the app. Then, they changed the app’s name to Snapchat. We should note that Spiegel and Murphy founded a company together prior to Snapchat. They created Future Freshman with another Stanford student, Danny Ruderman, to improve how high school students apply to colleges. While the Snapchat app is now listed as being produced by Snapchat Inc. in Apple’s App Store, Future Freshman is actually mentioned in an earlier description of the app recorded by Appitalism, an app directory. That description also has a copyright notice by the Toyopa Group, an entity mentioned in Brown’s lawsuit. A Twitter account, @pictaboo, has the Ghostface Chillah logo which now appears on Snapchat. It appears that the group considered Pictaboo as a name, since the picaboo.com domain name and @picaboo Twitter account were already taken. It also sounds like Spiegel and Murphy were the first to make a legal move. Brown alleges that the pair hired Cooley LLP to send him a “threatening letter” in 2012, before Brown filed a lawsuit. We are aware of the allegations, believe them to be utterly devoid of merit, and will vigorously defend ourselves against this frivolous suit. It would be inappropriate to comment further on this pending legal matter. Maybe Mark Zuckerberg can visit the pair again and give them some advice. He already reached out to the founders once, shortly before launching Facebook’s Snapchat clone, Poke.